Remember my vanity table makeover from last week? This is the stool that's supposed to go with it. Sadly, mine's been falling apart since I got it. It's been sitting dismantled and leg-less for months. It would be a shame to just throw it out or give it away to charity. So time for a makeover! It would better make for extra seating or an ottoman in our family room, anyway. This is how I reupholster a simple cushion project like this. First, remove all the screws and hardware. Put the screws in a Ziploc bag a LABEL IT! I've had disassembled furniture for days because I couldn't remember what I did with the screws. Have your hand model cover up your labeling while you take a picture. It'll help. Lay the seat on your fabric and trim 3-4 inches around it. I mark the middle of the seat so I know how to line up my fabric. I knew I wanted the plaid to repeat evenly over the cushion. If you're using an all-over pattern, don't worry about it. After I've found the center and lined up my fabric, I use packing tape to hold the fabric in place so it's tight and it doesn't move or shift. Then I work on getting super tight corners. This will be a very technical description,...promise. First, I puff out the corner. Then I pinch it together. Then I twist it as tightly as I can. Then I pull it taut and tape it down, too. Then you're ready to take your staple gun and staple the fabric securely and tightly to the seat. Use plenty of staples, but don't go nuts. If you change your mind or want to re-reupholster later on, it's a pain having too many staples in the way. I don't have a fancy shmancy or a super industrial strength staple gun. I got this Stanley "light duty" one at Target for $8, and it works great for projects like this. When I paint table or chair legs that can be detached, I always stick them through a cardboard box so they stand and I can coat them evenly. Looking good reassembled (with epoxy glue to hold the legs this time), but not quite what I had in mind. Nothing a few swipes of sand paper can't fix. The photographer I hired brought an apprentice to the shoot. Shabby Chic to French country just like that! I promise once you do it, you will be on the lookout at every garage sale, flea market and thrift store for any chair or stool with a cushion to reupholster. It's addictive! And of course, today I'm wishing a very happy birthday to the woman I want to be when I grow up. Martha, you're the best! very nice step-by-step! I've done this to several bench/stools over time. Love that you took sandpaper to it! Very smart looking! Looks great! Thanks for the all the photos along the way. Dang! That is one awesome stool. VERY impressive. Thanks for the how-to photos too! Great explanation! I have a stool that I need to recover, and your tutorial is so helpful! I love it...much better. The details are pretty cute on it. You did a great job. Wow, it looks amazing now. Nicely done! Very cute project and it looks great. I started a new KNOCK OFF KNOCK OUT party and I bet you have some things to put in the party-it's every Monday. I would love to have you submit this idea next Monday. I hope you come over and become a follower and subscribe and I will do the same. Love the ottoman but I liked it before too! Whoa! Thank-you for sharing. 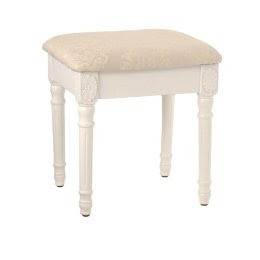 I was just talking to my husband last night about reupholstering a cute little stool we have. Thanks for the step-by-step directions, seriously! It looks cute !i love the red fabric!! !